Includes 108 Pieces of Halloween Decoration Picks and 36 Pieces of Spider Ring Cupcake Toppers. 12 Assorted Vitality Designs (Witch, Skull, Spider Web, Spider, Ghost, Pumpkin, Cat and Tombstone) in 3 Attractive Colors (White, Pumpkin and Black). Super Value Pack for Decorating Food. Perfect for Halloween Party Supplies and Halloween Decorations, Halloween Food, Halloween Cake Decorations, Halloween baking, Halloween Birthday Decorations, Spider Cupcake Toppers, Halloween Birthday Decorations, Decorating Halloween Parties Appetizers, Cupcakes & Cookie Toppers, Cocktail Picks and All Other Use. CHILD SAFE: Non-Toxic. Meet US Toy Standard. Safety Test Approved. CPSIA Compliant. 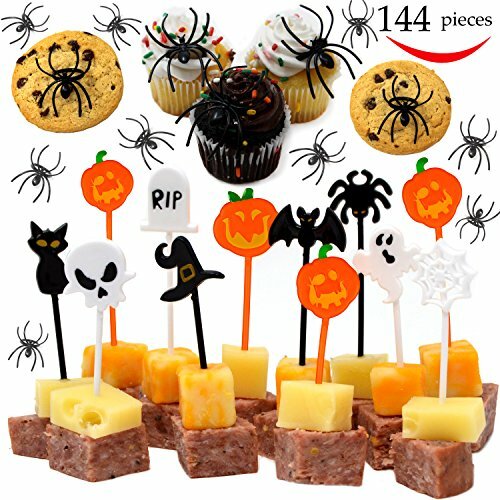 Halloween Party Supplies Set Includes 108 Pieces of Halloween Food Decoration Toothpicks and 36 Pieces of Spider Ring Cake Toppers. CHILD SAFE: Non-Toxic. Meet US Food Standard. Safety Test Approved. CPSIA Compliant.